← Somebody who really died after Sandy Hook. This entry was posted in DHS, Fear Mongers, illegal immigration, Liberals/Democrats/Left, Media, Race, social justice warriors/SJW, social media, United States and tagged #bluelivesmatter, Detroit, Facebook, ICE, Michigan, Michigan Humane Society, Rocky's Road Brew. Bookmark the permalink. Why don’t Christian bakers have the right to refuse baking a cake for a homosexual wedding, something THEY disagree with? How can leftists be so hypocritical? 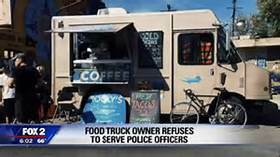 Then the Detroit PD should refuse to respond to the food truck owner’s calls for help. There’s a way to reduce that: don’t break the law. But for some, it’s easier to curse the darkness (or claim excuses) than to light a flame against it. “because of the madness” and backlash the posts have received, Rocky’s Road Brew temporarily will be closed. Meanwhile, the Michigan Humane Society officers will likely find another spot from which to get their snacks. LOL – Well, if this idiot is stoopid enough to reopen, I’m just sure the cops are going to come running when she gets robbed. The left is so full of thier own crap, they cant see the double standards and hate they promote.. They have constitutional rights but anyone who disagrees with them does not. People breaking the law but agree with thier views are protected and preferred over any lawful person who disagrees with them. I dont disrespect people for having an opposite view. Maybe I am part of the problem. My rights are being taken away and violated, but I am too respectful of the law and our constitution that I let it happen. Next time you’re robbed, call a CRACKHEAD. I swear to God: WHAT IS WRONG with these people??? Given their sentiments it may not be a good idea to eat from their truck. Well, the Red Hen can move to Detroit and they can go out of business together. They’re out there “stickin’ it to the man”. They are also first in line when the hand outs arrive. Just a permanent class of unproductive parasites. Who knew that food was a political statement? I wish they’d all move to N. Korea. Coronado is an imbecile. By letting it be known she will not serve law enforcement, she has left herself wide open to possibly be held-up, burglarized and assaulted/murdered. Criminals could care less what one’s political leanings are. They are an equal opportunity group who will take advantage of idiots like Coronado when law enforcement might just take a little longer to respond. I hope “ it “ doesn’t have to call the cops for help, it will take them a long time to get there, the flies will get there before.